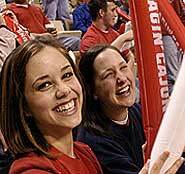 Eighty-seven percent of first-year students at the University of Louisiana at Lafayette rate their entire educational experience as “good” or “excellent” in a recent survey. TheNational Survey of Student Engagement conducts an annual survey. This year 362,000 students at 564 U.S. colleges and universities completed its questionnaire. Asked if they would attend the same university if they were starting over, 87 percent of first-year students said they definitely or probably would choose UL Lafayette. Of the senior surveyed, 78 percent said they "definitely" or "probably" would attend UL Lafayette if they were starting college again. • 70 percent said they are analyzing quantitative problems “very much” and “quite a bit. • 76 percent said they are analyzing quantitative problems “very much” and “quite a bit.